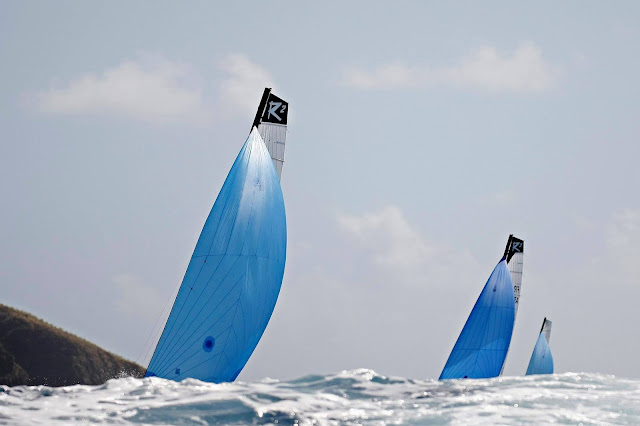 All images Michael Gramm & Pascal Alemany / St Barth Cata Cup, plenty more at event official web and their fb page. 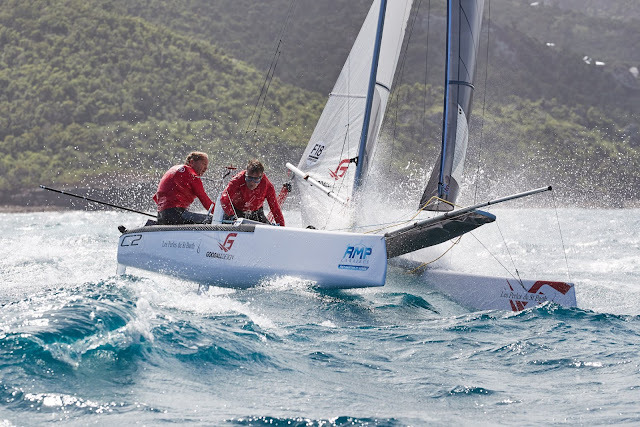 St Barth Catacup Day 3: While at Hervey Bay the A-Class couldn't start the Worlds on 22knots the F18s got more winds & waves at St Barth The Argie crews went leading again midrace but both had equipment issues this time around. In the first course of the day Volker-Mehl were leading rather comfortable when the shroud pin went loose , Pablo managed to jibe and Sergio caught the mast at 45 deg. Later they recover to a 6th. In the second race in the afternoon Gonzalez Smith-Heuser were also leading and their poly spi exploded , which relegated them to 9th. 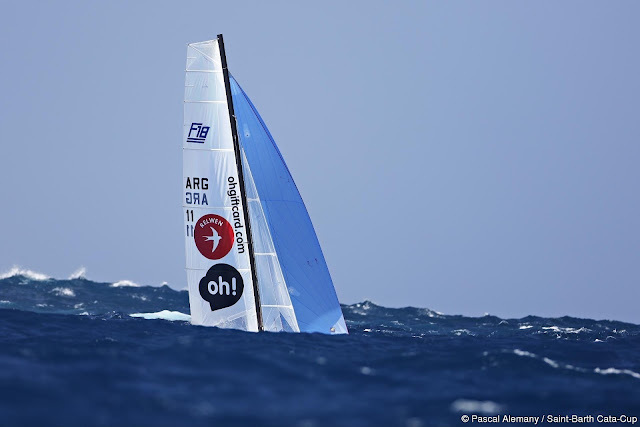 As noted the Arg teams are some of the fastest team on the planet on breezy days (remember 3 consecutive 2nds for Cruz & Mariano behind Mischa 2017 Worlds in the 20knots races) , but aside issues mentioned above on teir respective races they recognize Paschalidis & Trigonis have always an additional card on the right moments or a 6th gear when needed, the three of them are sailing the same equipment: Scorpion / 1D. 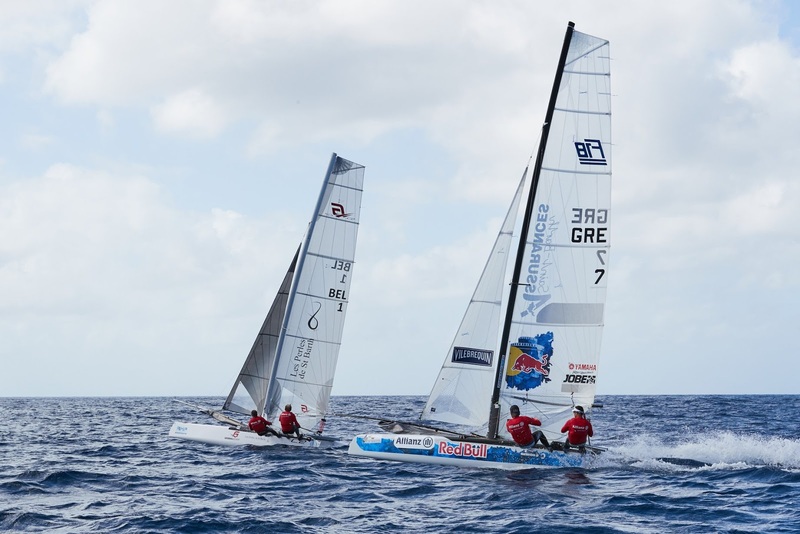 Danny & Kostas won both races to extend their lead. Mehl & Volker got another second to defend second overall and Demesmaeker & Gagliani (C2/Goodall) maintain 3rd. Figueroa-Booth 4th and Gonzalez Smith-Heuser 5th. Sailing Toward A Second Greek Victory? third day of competition for the 11th St. Barth Cata Cup saw almost ideal sailing conditions, allowing the committee to launch two great races. 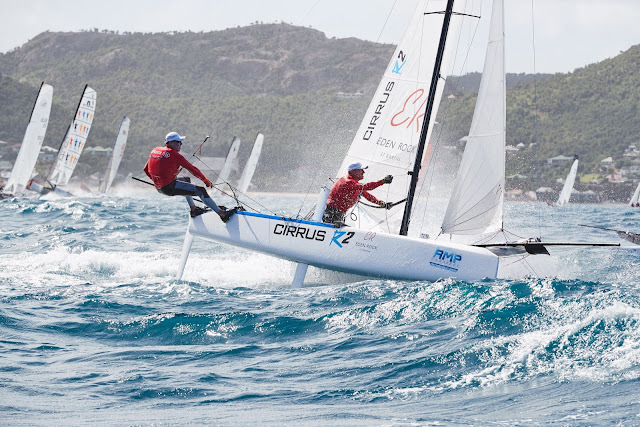 Both were hard-fought but finally won by Greeks Iordanis Paschalidis and Konstantinos Trigonis (St Barth Assurances) who, since their unfortunate error during the first race, which earned them an 11th place, have been seemingly untouchable. 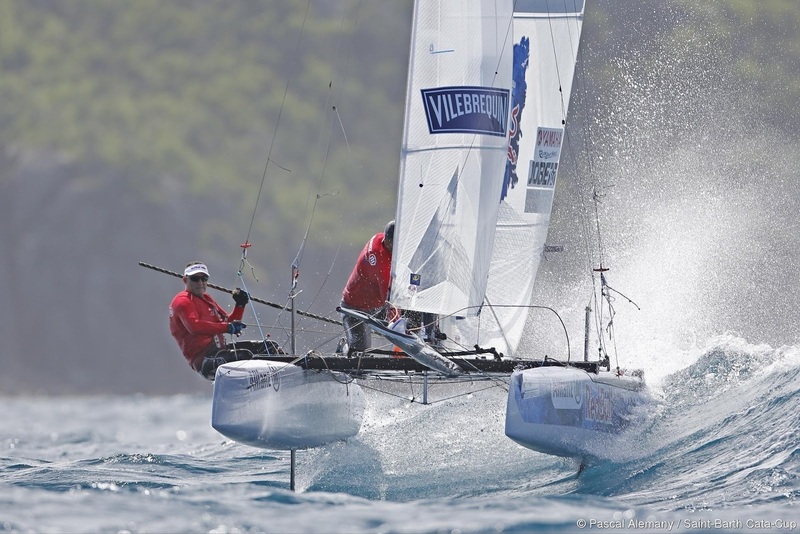 In fact, these current world champions have been sailing perfect races. 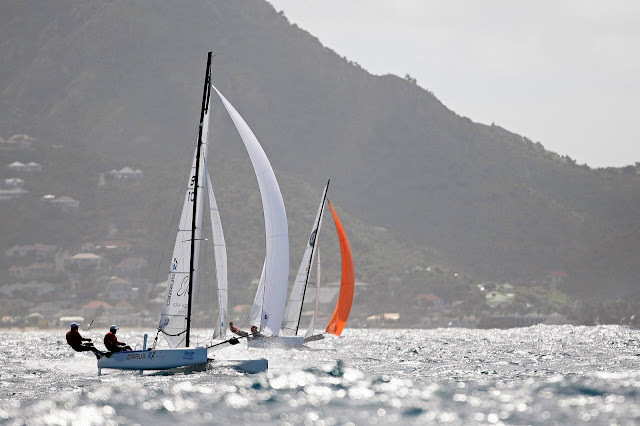 So this evening they are not only the winners of the Grand Prix “ST BARTH ASSURANCES-ALLIANZ,” but have also moved to the top of the provisional ratings, making a serious bid for an ultimate victory. Yet to succeed in that bid for a second consecutive win, the title holders have to remain vigilant, because hot on their heels, the competition is coming on strong. The proof is in the pudding: the five top boats in the overall ratings are within 11 points. Which means that the final race on Sunday, from Saint Jean to Public, will be the deciding factor. The Greek machine may be unstoppable. 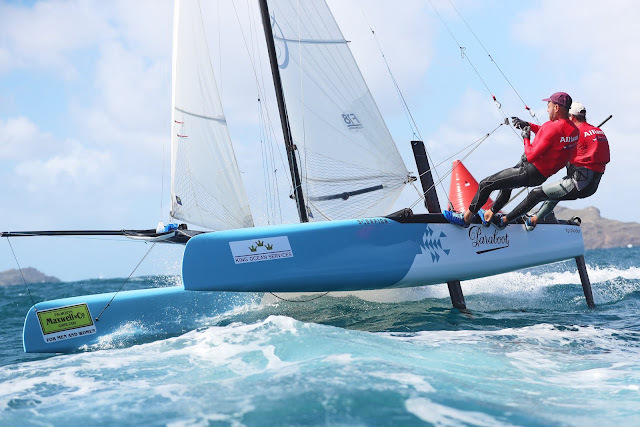 For example, other than their 11th place in the first race due to a tactical error, Iordanis Paschalidis and Konstantinos Trigonis (St Barth Assurances) have settled for nothing but first-place wins in the next four races. 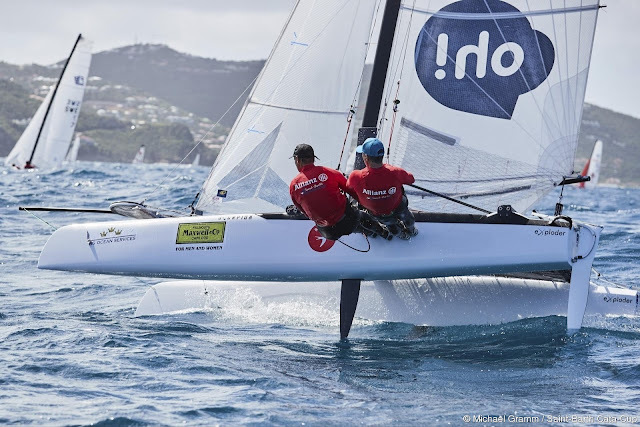 An “almost” no-fault performance, which has earned them respect, but not really surprised the competition, already quite impressed by them during the F18 Worlds in Florida last month. “We know that Iordanis and Konstantinos are perfectly prepared, well trained, and solid no matter the conditions, but we also know they are 20 to 25 kilos heavier than we are,” explains Enrique Figueroa. Yet, today, he and Ruben Booth, clearly back in the race after breaking their mast yesterday, gave them a run for their money, especially during the first race where they had to confront headwinds as best as possible, especially around Pointe Nègre, as well as during the second race of the day. “It’s true we had a good day, placing third in both races, or in other words almost the same score as the first day (fourth and third). We had hoped we could do better today, because we were sailing well, but we committed some errors. Two mistakes that we hope we will not regret later, if they are what keeps us from getting a place on the podium. 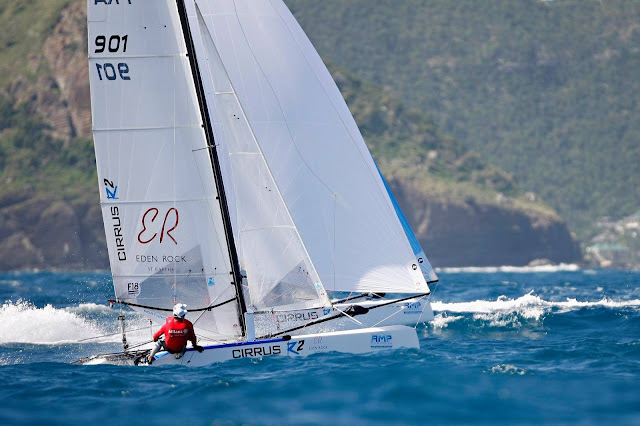 And with good reason, as the points are really close, especially with Belgians Patrick Demesmaeker and Olivier Gagliani (Les Perles de St Barth) who are, as of tonight, only three points in front of us,” added the Puerto Rican, who has sailed in the Olympic Games four times, and won the St. Barth Cata Cup in 2012. “We certainly do not plan on giving them our place on the podium, even if we saw already today that the duel has begun, as Enrique and Ruben stuck as close to us as possible, trying not to let us get ahead, especially this afternoon,” added Olivier Gagliani, who finds himself only two points behind the Argentineans Pablo Volker et Sergio Mehl (Paraboot by Maxwell & Co) and six points behind the Greeks. “We are happy to still be in the race and it promises to be a great fight to the end, but honestly the Greeks are going to be hard to catch. We don’t see anything that can keep them from winning at this point,” admits Olivier Gagliani, whose nickname is Trois Pommes. In fact, the duo of Paschalidis–Trigonis seems relatively impossible to budge, but it has to be remembered that they already played their joker (that famous race where they placed 11th, but was erased after the fourth race as per the rules of the regatta) and if they make another error or are faced with an eventual technical problem, their supremacy could be put in question. “Our blunder on the first day reminded us that we don’t have the right to make a mistake, and that was really a huge wake up call for us,” avows Konstantinos, who has his sights set on first place in the final race, on Sunday, and consequently, a second consecutive victory in the St. Barth Cata Cup. “Winning all of the races, that was our objective this year. While we now cannot win them all, we still hope to get as close as possible. That said, we know it won’t be easy. The St. Barth Cata Cup is a very hard regatta and people don’t really realize how hard since it takes place in an idyllic location, with a fantastic ambiance. Yet out on the water, it’s extremely physical. Of course, Iordanis and I are fast, but what makes the difference for us is our unfailing effort. As proof, even if we aren’t in front, we finish by getting ahead as the others get tired before us,” assures the Greek, who intends to exert that effort one more time, on Sunday, and finish with flair, especially if the organizers decide on a tour around-the-island for the last race. A tour with a coefficient of two and which could really turn things upside down.